ITR software is a reliable and comprehensive software for filing income tax returns. The software comes in four packages, namely; Basic package, Savings package, Super package, and CA package. Some of the features of the software that set it apart from competitors are ITR creation by tax experts, chat with expert, Form 16, HRA, rental income, CA review of ITR, etc. The software also consists of advanced features, such as tax saving suggestions, 60+ minutes discussion with CA, advanced advice on capital gains, and more. Cashofy is a cloud-based software company. With its subsidiary company, LegalRaasta, Cashofy has developed Accounting, ERP and Taxation software to ease the accounting and taxation journey of SMEs. Capital gain computation Holding period, indexed cost, long term capital gain, short term gain calculation & eligible exemptions automatically calculated with our income tax filing software. 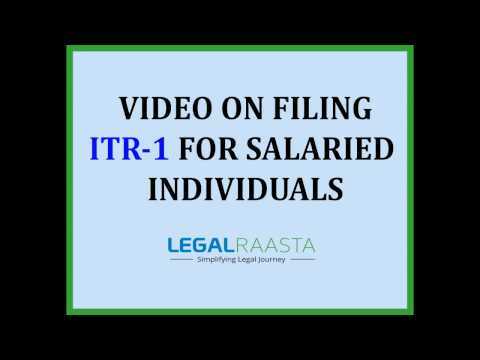 In this video we will guide you on how to file ITR-1. You can file return in ITR-1 if you are an Individual or HUF having: a) Income from Salary/Pension b) Income from One House Property c) Income from other sources like interest etc. ITR-1 cannot be used by an individual or HUF if he is having: a) Income from more than one House property b) Income from lottery winnings etc. c) Income from Capital gain. d) Income from Business or Profession. e) Income from a partnership firm. f) Losses under any head to carry forward to next year. g) Foreign Assets, Bank Accounts, Income from outside india or is a signing authority in any foreign account. Q. Why should I choose TaxRaahi ITR software over the government return filing utility? Rather than displaying countless fields with an official looking Excel/Java utility of Govt. that contains limited descriptions – one has to keep looking for set of instructions to understand what is to be entered in each column our ITR Software is extremely intuitive and easy to understand. Simplifying taxes for you : We have broken down the complex process of filing income tax return into a series of tabs/windows where you are asked questions in an interview style so that you do not miss out on important forms or schedules. Rather than flooding you with irrelevant and less common questions. TaxRaahi software makes sure that you are asked questions that are likely to be applicable to you. You can choose in the beginning which section you want to work on and eliminate the sections not applicable to you. Our software also places help tooltips against questions making it a less confusing and time saving solution for filing income tax return. Fully Automated : While you are answering simple questions about your income and expenses our software automatically computes and prepares your tax return in the background. It is software well suited for both first time and experienced fillers who are looking for affordable options to file ITR Return. We offer plans suited for those as well who want to file ITRs in bulk. Importing Feature : You can import Form 16 PDF format & automatically fill in the tax fields, eliminating the need to punch in data manually. You can also import form 26AS automatically from our software to match the tax credit entries and thus saving time in filing your return. User Friendly : It has a clean interface with a step by step process also letting you easily navigate back and forth unlike the cluttered and confusing government utility. Questions are simply worded with tooltips and suggestions on how to answer. Excellent Customer Service : To assist you we have a customer support team to provide assistance on both chat and phone, learn section with 100+ articles and guides. If you find that your financial information is too complex you can consult our tax professionals and Buy our CA-Assisted plans to file your Income Tax Return. Q. What are the charges of return filing at Taxraahi? Q. Do I need to upload the xml manually when filing returns via Taxraahi? Q. How are the taxes computed by TaxRaahi ITR software? Q. What are the different types of returns? Can I file these returns via Taxraahi ITR software? The type of return form in which you should file your return varies as per the category of assesse. For Individuals/HUF: ITR-1, ITR-2, ITR-3, and ITR-4. ITR 1 : Income from Other sources, Salary, Pension, Income from up to 1 house, Agriculture Income less than Rs. 5000 and Total Income is less than Rs. 50 lakh. ITR 2 : Individuals and HUF having Income from items in ITR 1 which is more than Rs. 50 lakh, Income from capital gains, Foreign Income, Agricultural Income more than Rs. 5000, Income from Business or Profession under a Partnership firm. ITR 3 : For Individuals and HUF having Income from items mentioned in ITR 2, Income from Business or Profession under a Proprietorship Firm. ITR 4 :Income from presumptive business as Section 44AD – Business (Deemed Profit-8% or 6%), Section 44ADA – Profession (Deemed Profit-50%), Section 44AE – Transporters (Deemed Profit- Rs. 7500/vehicle per month). ITR 5 : For Firm, Limited Liability Partnerships, Association of Person, Body of Individuals, Artificial Juridical Persons and Local Authority or Co-operative Society. ITR 6 : Companies that are not claiming the exemption under Section 11. ITR 7 : For Section 139(4A), Section 139(4B), Section 139(4C) and Section 139(4D). On the basis of incomes entered, the type of ITR is to be filed and is determined automatically.